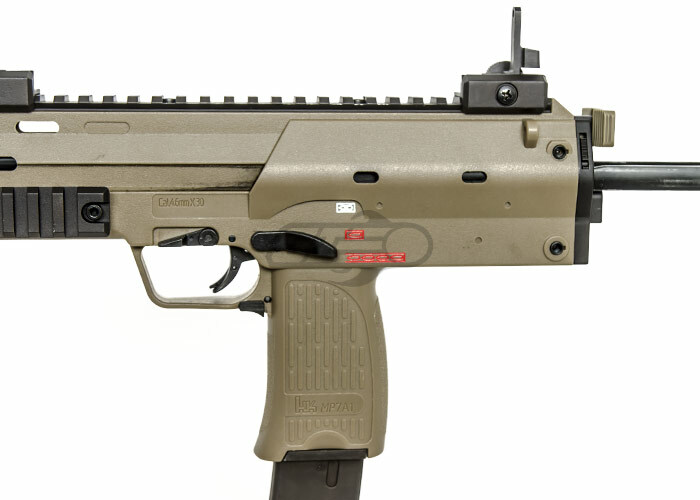 The KWA H&K MP7 is a fully trademarked gas blowback SMG. KWA did an amazing job with the build quality of the MP7, the body is made of a high quality high impact resistant ABS plastic, similar to the real steel counterpart. 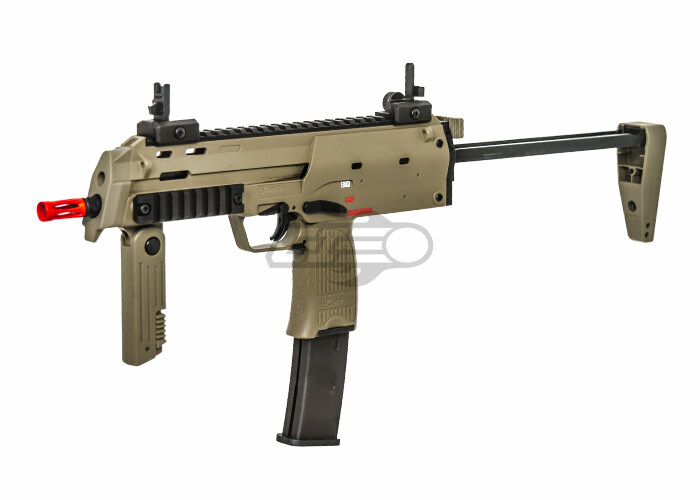 The metal parts include the retractable stock, iron sights, and the picatinny rails. The vertical grip can fold up or down for the user's comfort. The stock has two positions, closed and open. 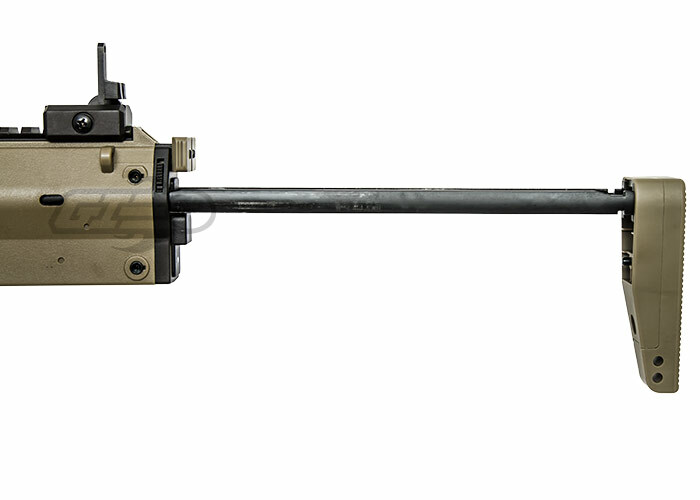 The iron sights work in the down position and can be flipped up for longer range target acquisition. Every function on the MP7 is ambidextrous; the fire selector, the magazine release, the slide release, and the charging handle. The button to release the stock is the only thing that isn't on both sides, but the gun is so small, and the button is located on the rear most portion of the gun that it can be accessed with either hand. 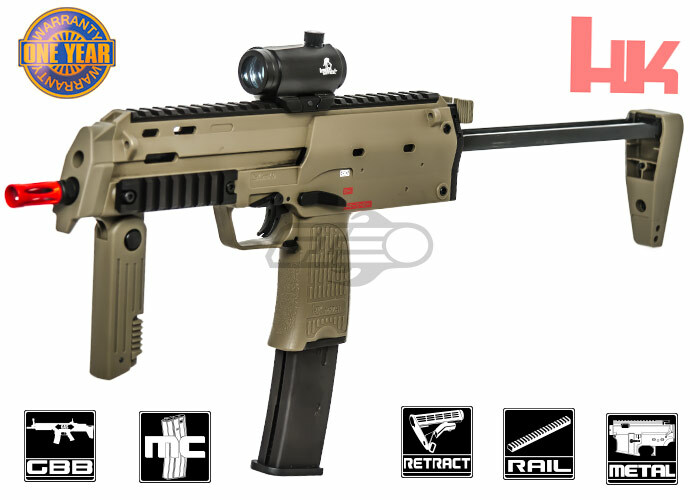 With the H&K trademarks legally placed all over the gun, and KWA's immaculate construction, this could easily be the most realistic airsoft MP7 to date. Product Does Not Include Red Dot. Airsoft GI recommends using Green Gas to power this product. 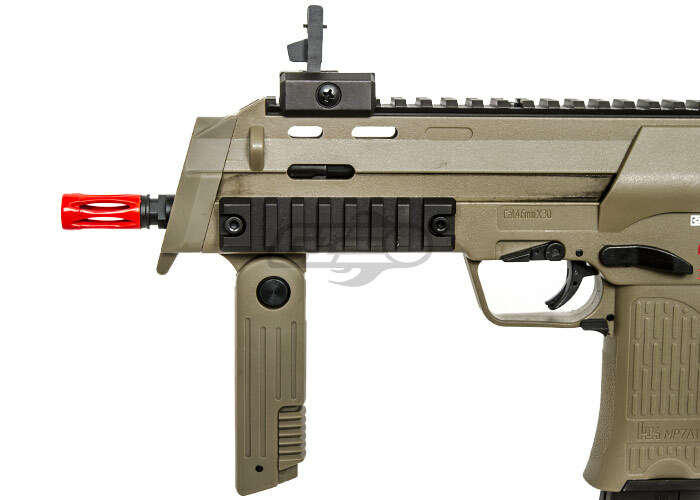 I own the black KWA MP7 and I've had the tan one for about a week already. Awesome gun and it's nice to be able to get a tan version of it. The performance is amazing. It is my favorite airsoft gun by far. As a ref at an airsoft arena, this gun is very consistent! initially out of the box, this gun shoots hot! 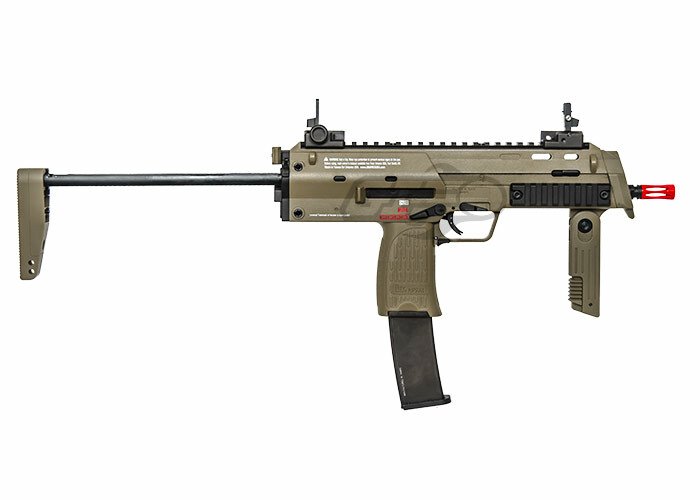 but once you put the appropriate cqb bolt in this gun, this thing is amazing in an indoor arena. If you love gbb pistols and want to move into a rifle, this is one stop you might want to take! (p.s. i bugged my co-workers who are techs, "They are fun guns, but can be finicky at times.") hope this helps. -I put a cheap $12 red-dot sight on this... it shoots lasers! very accurate!!! -Using propane; I'm able to dump one 40rd. mag no problem with extra gas. -My co-worker refs are Jelly! -Wait for special deals, I kicked myself for missing the "4th of the July Sale"
-The cqb bolt is not cheap, and tech service may be involves. -Clean this gun regularly!!!! "not a con for me, I'm slightly OCD"
The inner barrel should be 160mm in length. Only 12mm MP7 style flashhiders will fit on this gun, unless a threaded adapter is used. 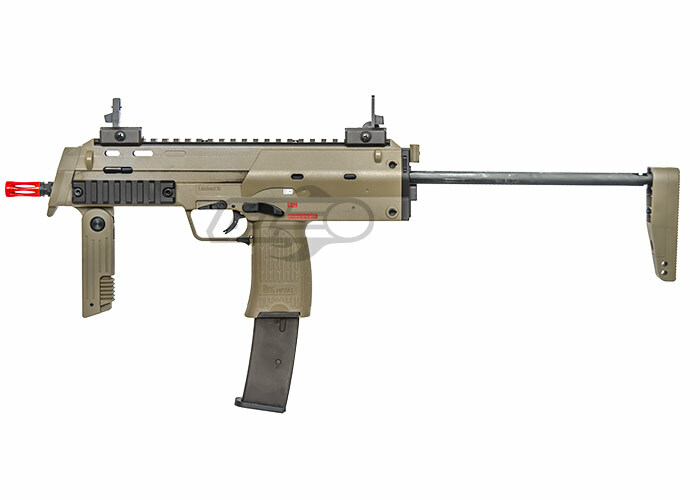 Will the Elite Force 40rd H&K MP7 Navy GBB magazine work with this gun? 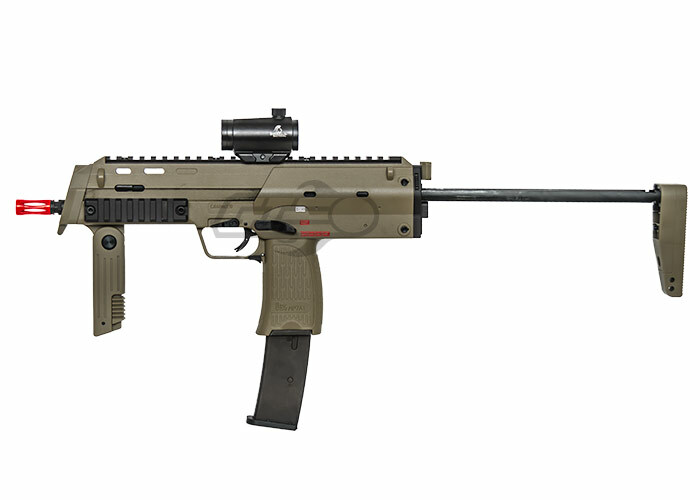 Can I plot the upper and lower on this one and a black mp7 and make a multi toned gun?